What’s the safe temperature for cats indoors? As a pet parent, you’ve probably gone through a lot of moments where, in an attempt to offer your furry baby the best, you might end up doing the wrong thing. It’s the same with houseplants – out of love, we can overwater them or place them in a spot where they get too much light. The same happens with cats and dogs. In the winter, you might think that your cat can get too cold when you do, but humans and felines (including domesticated ones) have different requirements in terms of ambient temperature. Let’s look at some facts that you ought to consider before adjusting the thermostat. What temperature is too cold for cats? Whenever the temperature drops below 60 degrees, most domestic cats are known to complain. If you live in a cold climate and you want to save some cents on your heating bill, you might want to make sure that you have several warm and cuddly blankets nearby so that your feline buddy has a way of remaining warm. It’s not as easy to tell what the ideal room temperature for cats in winter is, and that’s because there are several factors to consider. The breed, as well as your pet’s age, are just two. Needless to say, a Norwegian Forest cat won’t have as much trouble regulating body temperature as a Sphynx cat, especially when it’s cold. Hairless cats should be cared for differently compared to long-hair breeds. In case you didn’t know, the body’s natural ability to regulate its own temperature lowers as it gets older. This happens in humans and all other mammals, so if you have a senior cat, you might notice that he or she starts to prefer resting in areas where it’s warmer – such as next to a radiator, for example. There are also differences when it comes to the cat’s gender. Sure, some people might think that this is a myth, but the truth is that females have a bit of a harder time regulating their body temperature in colder environments compared to males. If you have a female feline friend, she might seek to sleep underneath the covers if it gets cold in the house. What temperature is cold for cats? The short answer to this question is anything under 60 degrees. If you leave your cat alone in the winter, we’d suggest adjusting the thermostat between 60 and 70 degrees depending on the breed, gender, size, health, and age. Old and young cats prefer temperatures between 70 and 80 degrees. What other factors influence my cat’s ability to keep warm? There are two other things that can take a toll on your cat’s ability to maintain safe and comfortable body temperature, and these are her size (and the amount of fatty tissue in her body) and her health. Cats that have thyroid problems are known to avoid heat, so they will stay away from radiators. On the other hand, if your cat has an infection or worse, there’s internal bleeding going on, she is at risk of developing hypothermia. Many infections are characterized by fever, but not all of them. If your cat is recovering from an illness, we would suggest using a heated cat bed to ensure that she remains warm. The size is pretty self-explanatory since body fat acts like a thermal layer against the cold. In the winter, you have complete control over the temperature in your home, but in the summer, you don’t have the same benefit. If you leave your cat home alone for a whole day while you are at work, she might be exposed to several dangers. As you might know, cats love being warm, and some might love heat to the point that they can’t realize that it might pose a real threat to their health and safety. That’s what happened with one my older cats, for example. I was a kid when this happened, but we usually allowed him to sit in the sun in the summer, out on the balcony. One day, my grandpa forgot about him, and he ended up spending several hours on the balcony. Once he found him there, my grandpa got him back into the house and tried cooling him down. The cat was really dizzy and sleepy and had trouble coordinating his moves. He did get back in shape after a few hours, but he was quiet for the rest of the day. Cats that are left under the sun for too long have a high risk of developing pulmonary congestion, and that’s something that I learned when I was in Vet School. The point that I’m trying to make is that, if you’re looking to provide a safe temperature for cats indoors, in the summer it’s important for you to check that you have your curtains or blinds pulled. Temperatures between 80 and 90 degrees are usually well tolerated, with kittens being capable of withstanding the 90 threshold better than adults. As such, the perfect house temperature for cats in summer is within these limits – anything above 90 is too hot. There are certain behaviors that can give you a pointer as to whether the indoor temperature is just right for your cat or not. Your feline buddy will try to compensate by selecting a spot that makes him or her more comfortable. You’ll notice that it takes a bit of time for the cat to find the right place where he or she feels really warm and at ease. Cats that are both affectionate and lovers of warmth will try to sit in your lap or cuddle under a blanket. If you don’t usually close the blinds and your cat doesn’t have a spot where she can get cooler by sitting in the direction of the AC, she will let you know by meowing. You might not be able to understand what’s wrong, but part of our responsibility as pet parents is trying to interpret the signs of our feline companions as best as possible. If you tend to turn the thermostat down during the night – and for a good reason, too, since you can get better sleep in cooler environments -, you might end up sleeping with your cat in bed because it’s quite likely that he or she will cuddle up next to you. A cat’s body position can also tell you if the temperature is too low or too high. When cats are cold, they curl up in a ball and even wrap their paws up tight. If they’re a little warm, cats typically sprawl out and choose a cooler spot – they might even have a nap on the floor. Not only is it uncomfortable for a cat to get too cold in the winter, but there are also studies that have suggested that cats get depressed during this season. They are quite sensitive to sunlight, so they won’t exactly feel at ease when they don’t see it for several months. To prevent this, you should engage your cat in play as often as possible, provide a generally stimulating environment, and you might even have to consider bringing in another cat. Show your cat you care about her by petting her whenever you get the chance, especially if she is one of those cuddly ones that can’t wait to jump in your lap and seek attention. Most cats can make the difference between their pet parent’s voice and those of other humans, but if you tend to leave your cat alone for many hours during the day while you are at work or school, it might not be such a bad idea to leave the TV on. Apparently, this practice can help cats feel like they have some company. Your cat will tell you when the temperature isn’t right, either by seeking a place where he or she can get warmer or can cool down. It is up to you to try to interpret these signs. If you do not want to make any changes – turn the temperature up or down -, you can get a heated cat bed or a heated blanket in the winter so that your feline companion has a perfect spot to rest in. In the summer, avoid leaving your cat in a house if you haven’t closed the blinds. 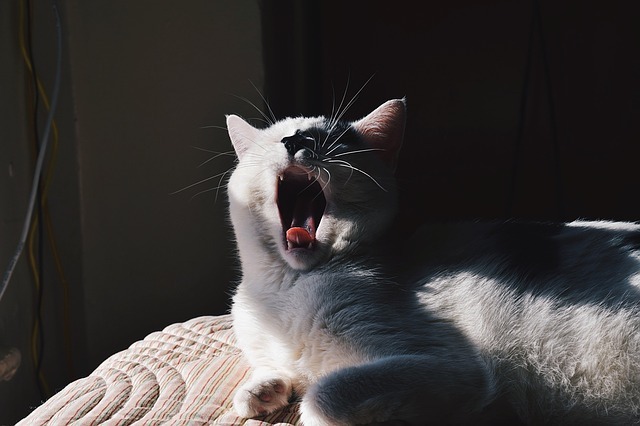 Prolonged exposure to the sun can damage your cat’s health and can even expose her to dangers such as pulmonary congestion. The perfect temperature for cats in the winter is between 60 and 80 degrees and the right one in the summer is between 80 and 90. 75 to 80 degrees is always comfortable regardless of the cat’s age, health, gender, or any other factors.